R Nor is an interesting Mira star that has been observed by AAVSO observers and members since 1911. The first observations were made by the active southern observer James Baldwin from Melbourne, Australia. Nearly 9,000 observations are in the AID from over 130 different observers as can be seen in the light curve shown below which displays all observations in the AID. It is one of the Legacy South LPV Program stars. It is a star that has interesting properties only shared with a handful of other Mira stars as will be explained shortly. The Figure below shows all observations in the AID. Its spectral class is M3e-M6II according to the GCVS and is classified as a Mira. The GCVS lists R Nor as having a visual magnitude range of 6.5 to 13.9 with a current mean period of 507.5 days whereas the VSX lists the mean period as 496 days. The unusual aspect of R Nor is that it’s one of only a handful of stars with a dual maxima clearly evident in the light curve. It consists of a bright maximum (Max II) and a fainter one (Max I). According to the GCVS, the phase of Max I is 0.7P and Min I is 0.43P whereas Min II phase is 0.85. The GCVS also notes that the mean period (based on Max II) has varied over the years. From 1876 until 1927, the mean period was 486.94 days. Between 1930 and 1942 it was 500.56 days and between 1942 and 1953, it was 489.0 days. Since then, the GCVS lists the mean period as 507.5 days. A DC DFT analysis of all observations in the AID shows an overall mean period of 497.7 days (harmonics of 249 and 166 days are clearly evident which indicates a non-sinusoidal element of the light curve). An annual alias period of 210 days is also readily apparent. There is also another signal at 514.6 days. 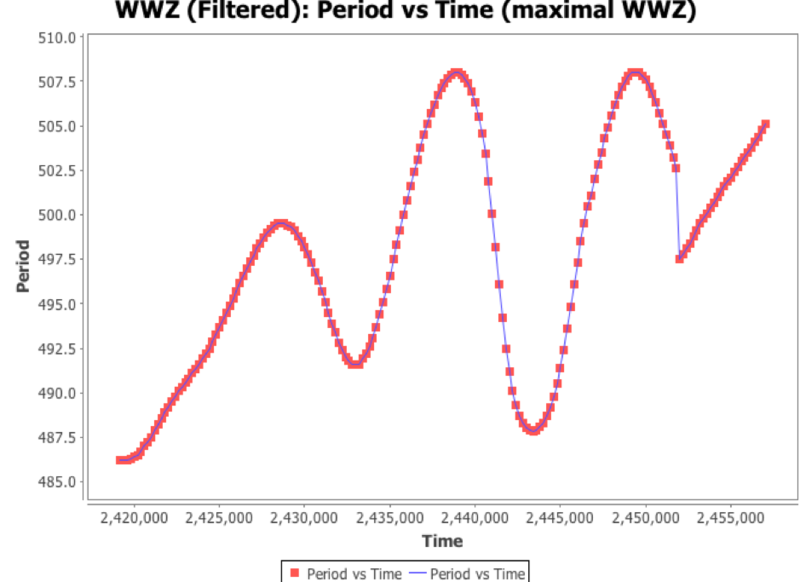 A WWZ analysis has shown that the mean period has been relatively stable remaining between a range of 487 to 507 days with a regular meandering behaviour which is quite common for many long period variables. The most interesting feature displayed by R Nor is the dual maxima. The GCVS lists only 5 stars that show this sort of behaviour. These are R Cen, BH Cru, UZ Cir, R Nor and BN Sco. However, recent searching of ASAS data by Sebastian Otero has indicated there may be more (eg HR Pup and ASAS J143751-6454.9). The Figure below shows the last 3,000 days of data where these dual maxima can be seen. The Figure below shows the last 2,000 days of data and 20 days means are plotted (blue line) which clearly shows them. Although a bit noisy, the dual maxima can also be seen in the phase plot below which contains all observations in the AID. S. Uttenthaler et al. studied R Nor and noted that it is a fairly massive star (4 solar masses) and that this may be a characteristic of dual maxima Miras. They also note that it contains a significant amount of lithium which is typical of meandering Miras and is very similar in this respect to R Cen. It is estimated to be approximately 800 pc away. R Nor is an interesting Mira to follow so all are encouraged to maintain sufficient coverage.